How can weekends go by so fast?!! I really don't like it. I think weekends should be three days long. Despite going by quickly, our weekend went well. I didn't quite get everything done that I had planned as having your car battery go completely kaput on you really changes plans on leaving to go get plants at the nursery, but things were done. Ben is almost done putting together another garden bed (I can hear him hammering outside as I type this). I cleaned out the front porch, did some weeding and deadheading in the garden, and did some garden furniture moving around. I made enough space back there that we will have room for another 6 ft. long garden bed. We are so excited, but now we just have to actually make it. A project for next weekend? Maybe. Though we don't have one, as you see in the picture above, we still had a family movie night. What did we use? A projector, computer, and nice, big, white wall space and we had ourselves our own movie theatre. So having no television doesn't mean we will cut out family movie nights, cause those nights are special. We had lots of them when I was growing up and Ben did too. What was showing at our house? Tangled. And the girls loved every bit of it, even Soulie. Hope your weekend was just as swell! I am starting off Monday with a huge pile of clean laundry to put away, so let's hope I can find some time to do it. I also don't like the fact that weekends go by so fast! And I think would it be three days long it also would be to short! What about five days weekend and two days worK? penny and jazz- i am right there with you on that idea! that would be bliss!!! We used to have only a projector too! I kind of miss the days of no tv and just using our living room wall for movie nights, there's something magical about it! Since i end up watching everything on my computer anyway (though last night i got sucked into watching SIster wives cause i just cant believe how any woman could be ok with that situation...) I totally wont mind giving up my tv and just using a projector, or having a tv with no cable and just hooking my computer up to that. Wow, they look absolutely mesmerised! 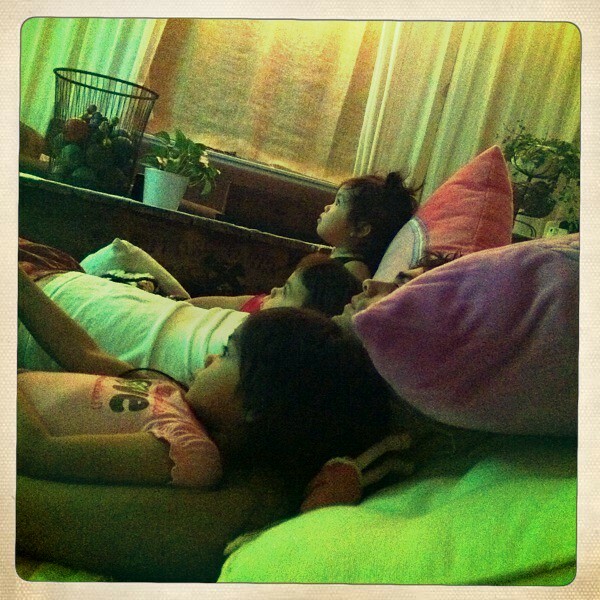 Family Movie Nights were a big thing in my household, too - it's why I love movies today. But I completely agree with you about TV just being a time vampire, so well done! A projector is so rad. Your girls should be lucky. I think my husband would be jealous! a projector movie night! so dreamy! We made the choice to go without cable in order to save money. We get along fine with just Hulu Plus and Netflix. I mean, come on, all the entertainment you want for less than $20 a month? Score! My daughter just loves She-ra! It's so fun to see her getting into it like my sister and I did. Also we are big fans of Tangled over here. My daughter is convinced she going to marry Eugene. She is asking God to turn him from a cartoon to a human. Nothing is impossible right? OMGOSH , SOUL IS SO CUTE WATCHING!!!!! misha- soul was completely addicted! anklebiter books- there is a connector from the projector to the lap top. just like you would for a power point in a college class. hayley- i love your daughter's prayer. when i was a kid, i wanted the barbie in the barbie commercials to come out and be my big sister. i wanted a big sister soo badly!!! flaxseeandsoynuts- we have lots of tomato plants, but let's hope and pray they all do well. so much learning behind it. and... last year, we had 29 varieties and they all did so so. we are hoping this year is better! oooh... tangled was the first movie the girls watched in a movie theatre and when we happen to pass the theatre they always yell "rapunzel"!!!! I think they think she lives there! So fun!!! How blessed you are with such cuties!!! And I respect you guys for your "no tv" decision...how great!